On behalf of the Kearsney College Parents’ Society, we welcome new parents to Kearsney College. A special welcome back to Old Boys who have returned as parents, and parents with older sons already at Kearsney. To promote the welfare of Kearsney College, specifically the well-being of the boys by providing assistance with bursaries; allocating funds towards the boarding houses; contribute funding to Matric Dance; promote friendly relations, support, co-operation and liaise between parents, society members, the governors, the Headmaster and staff; assist the College in marketing initiatives. Parents’ Society meetings are open to all Kearsney College parents. They are held on the second Tuesday of each month in the Greyhound Board Room at 18h00. The 2018 AGM will be held on 30 January 2018. The 250 Club is a sub-committee of the Kearsney College Parents’ Society. The principal purpose is to raise funds from members’ subscription fees to provide bursaries for carefully selected boys, making it possible for them to receive all the advantages of a Kearsney education, as well as to provide a wonderful opportunity for parents, staff and Old Boys to socialise, make new friends and keep in touch with existing friends. The Greyhound 250 Club hosts social functions which are always eagerly anticipated and lots of fun. Membership of the 250 Club for 2018 is R740 per family and members enjoy free entry to one function during the year. 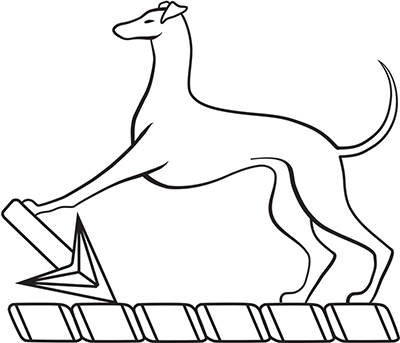 If you are not yet a member and would like to join The Greyhound 250 Club, please complete and return this application form (download) to Kearsney College reception or email the completed form to Mrs Vuyo Motsoahae. Should any current members wish to resign from the 250 Club, they should do so in writing to Mrs Vuyo Motsoahae. Parents’ Society AGM – 30 January 2018 at 18h00. The event was held the day after the Matric Dance using the same decor. The eagerly awaited final function of the year was the Fabulous ‘50s-themed dinner and dance which was great fun. A wonderful morning was enjoyed by the intrepid runners of all ages that took part in the very first Kearsney Trail Run. The highlight of the run was the section through the Conservancy where the hidden beauty of this part of the campus was revealed to the participants. Although both the 3,8km and 5,7km courses were challenging, each runner finished with a smile on their face and a promise to return again next year. We look forward to planning our next Kearsney Trail Run. The College thanks Mrs Brenda Moon and the Parents’ Society for this initiative and all the work put into making this inaugural event fun for the participants. The Parents’ Society thanks Mr Vaughan Carlisle and support staff who assisted to create the beautiful venue in the Henderson Hall for the Annual Kearsney Ball held on Saturday 07 March. Thanks also go to the Mums (and a few Dads) who put in many hours to ensure that the function was the success. 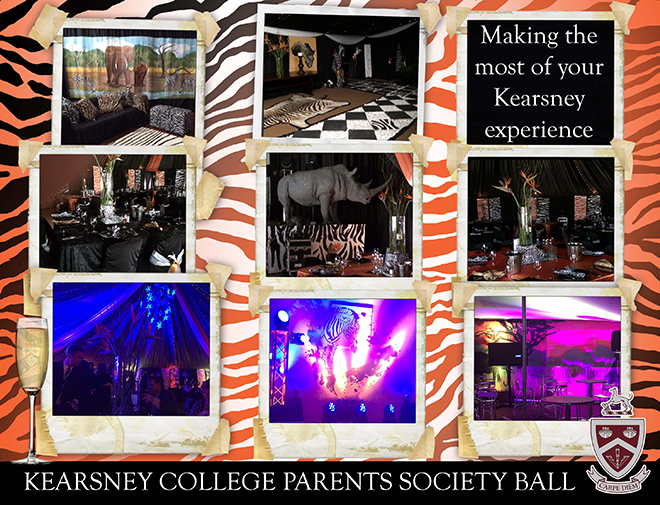 The Annual Kearsney Ball is an event for all Kearsney parents, Old Boys and friends. It is the only function of the 250 Club during the year which is a paid function. It is held the day after the Matric Dance to curtail the cost of the Matric Dance. There are two functions still to come this year which fall under your 250 Club membership. All parents are welcome to attend the forthcoming events and we encourage you to participate – they are a great deal of fun and a great way to make friends and to truly become part of the Kearsney family. The second and final function of the year for the” Greyhound 250 Club Bursary Fund” was a Dinner Dance held in the Grade 11 dance marque at the Greyhound on 6 September. The theme was the “Last night on the Titanic”.Against the magnificent backdrop of the Grand Staircase of the Titanic a delicious dinner was enjoyed by all 250 Club members and their guests. The rest of the night was spent dancing the night away and being entertained at the tables by a magician. I would like to say a special thanks to Mrs Alison Millar, the Kearsney Parents’ Society, the Grade 11 Dance Committee and KKS Caterers for all their support. Without them this event would not have been possible. To the Members of the Greyhound 250 Club Bursary Fund, an even bigger thank you for supporting this very worthy course and we hope you have enjoyed all of the functions this year. We will see you in 2015. The 250 Club evening at the Barnyard Thetre on 20 June was attended by 223 people of which 158 were 250 Club members and the rest were staff, non-members and guests. Although the attendance was slightly down from last year possibly due to the late finalisation of 250 Club membership debits and, more especially, the tougher economic climate, ‘Time Warp’ was an enjoyed by all who attended. The show itself was loosely based on Somewhere Over the Rainbowwith a more modern beat. The Parents’ Society hosted their annual ball on Saturday 08 March, enjoying the splendour and magnificance of the decorated hall, the brain child of the very talented Mrs Tracey van den Aardwag. It was a relief to have the bedouin tent up since we were not lucky with the weather. My thanks to Chester Foster (KCOB) who erected the tent on Saturday morning . The TV also provided transmission for those rugby die-hards who were able to celebrate the Shark’s win in real time. TV aside, the evening was a huge success, I am sure our boys consider us too old to party. This occasion was proof that there is still life in all of our ‘mature’ bodies! Thank you to the parents who attended, as they made the entire evening such a success. There was a dedicated team of ‘back room’ people who worked really hard to ensure the event was a success. Thank you to Sigrid of KKS for the catering, Arlette for completing the unenviable task of laundering the table cloths and serviettes, Sharon for her assistance at the bar and of course my special thanks to the team of helpers, moms and dads alike, who with their never ending supply of energy and enthusiasm just got stuck in. And to all parents, look forward to seeing you there next year.